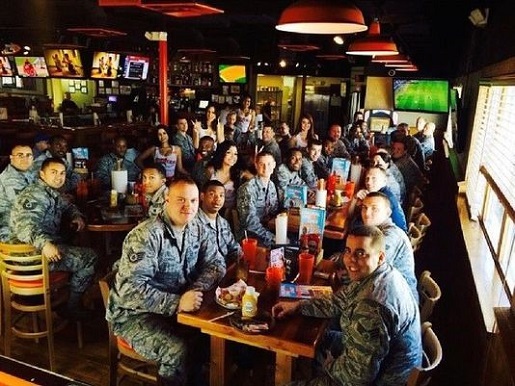 A group of military enjoy a free meal at Hooters. Veterans make a lot of sacrifices for their country. From missing time with family to giving up their lives and health in the service of the nation, they give up more so we can enjoy freedom and prosperity. Lots of people respect them, even criminals. So when Veterans Day rolls around, retailers line up for the right to give veterans free drinks, free meals, and whatever free services they can afford to give away. Here’s your yearly round-up of free stuff for Veterans Day from a variety of national retailers for both veterans and active-duty military. Applebee’s, Chili’s, Golden Corral, Hooters, Shoney’s, Red Robin, IHOP, Bob Evans, Max & Erma’s… all of these places are giving veterans a free meal. For some, it’s anything on the menu with the purchase of a drink; for others, it’s a specific free meal (like Shoney’s All American Burger or Red White And Blue IHOP pancakes). If you need a pump after gorging, 24 Hour Fitness is giving a free gym pass to veterans on that day. If you need something to wash your meal down with, CraftWorks Restaurants & Breweries (Old Chicago Pizza is one of their properties) is giving a free craft beer to vets. Then head over to Great Clips and get a free haircut! That’s a lot of free stuff, but it’s nothing compared to the sort of treatment veterans should be given for their service, especially if they’ve been injured or disabled in the service of their country.